Trainer Graham Motion is looking to field an eclectic assortment of horses during the Belmont Stakes Racing Festival, from the up-and-coming 3-year-old Rugbyman, who is entered in the $150,000 Easy Goer on Belmont Stakes Day, to the stalwart Augustin Stable homebred Spring Quality, who at age 6 will be making his first Grade 1 appearance in the $1 million Woodford Reserve Manhattan at 1 ¼ miles on the turf. 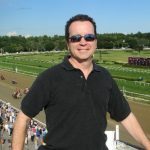 Motion also is pointing Lady Alexandra, who won the License Fee in her first start for him, to the Grade 3, $200,000 Intercontinental on opening day of the Festival, Thursday, June 7; European import Esquisse to the Grade 2, $600,000 New York presented by NYRA Bets on Friday and Serena’s Song winner Bernedto the Grade 1, $750,000 Ogden Phipps on Belmont Stakes Day. Rugbyman, a gray son of Tapit bred and owned by Wertheimer Et Frere, finished a closing third in his debut on April 13 and followed that with a rousing 14-length maiden victory over older horses at a mile at Belmont Park. Spring Quality, a son of Quality Road out of the Deputy Minister mare Spring Star, made a single appearance at age 2, winning a seven-furlong maiden at Keeneland, then reappeared in the spring as a 4-year-old to take an optional claimer at Tampa Bay Downs. 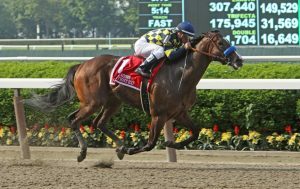 Given more time off, he finally began racing on a consistent basis in 2017, notching his first graded stakes win in November in his second start on turf in the Grade 3 Red Smith Handicap at Aqueduct Racetrack. In his first start this year, he was beaten less than a length by fellow Manhattan hopeful Robert Bruce in the Grade 3 Fort Marcy. Spring Quality was entered in the Robellino at Penn National in August, which wound up coming off the turf and which he won by a neck. He followed that by finishing second in the Roanoke at Parx, and an encouraging fourth in the Grade 2 Knickerbocker at 1 1/8 miles at Belmont. Lady Alexandra, who was purchased last year for $375,000 by the Heider Family Stables at the Horses of Racing Age Sale at Keeneland following an optional claiming victory at Belmont in June, made one subsequent start at Saratoga for trainer Tom Proctor, finishing eighth in the Coronation Cup. Sent to Motion over the winter, she trained forwardly and made her 4-year-old debut a winning one with a 3 ½-length score in the License Free going six furlongs. “I was extremely impressed with her performance in that race,” Motion said. Esquisse, who arrived in Motion’s barn in late fall of 2017, finished third, beaten 1 ¼ lengths in a one-mile allowance in April at Keeneland and second, one length back, in an optional claimer on May 18 at Belmont. Berned, owned by Robert Masiello and West Point Thoroughbreds, would be making her third Grade 1 appearance in the 1 1/16-mile Ogden Phipps, having finished fourth in the Coaching Club American Oaks at Saratoga last summer and seventh in the Starlet at Laurel Race Course as a 2-year-old while under the care of Tom Albertrani. The Bernardini filly is 1-0-1 this year, with a third-place finish in the Grade 2 Barbara Fricthie at Laurel and a sixth in the Grade 3 Distaff Handicap at Aqueduct.